We're pretty much settled on birds being dinosaurs, but what would happen if we genetically engineered chickens to be a bit more like the dinosaurs of old? 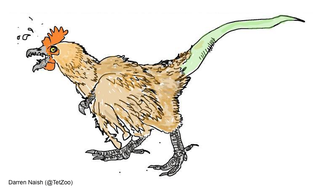 If Twitter's volunteer paleontological illustrators have it right, the chickensaurus would the essence of horror. Let&apos;s Try to Settle This -- Are Birds Dinosaurs? The entire concept of a chickensaurus is fundamentally ridiculous — as Trish (@Babbletrish) points out, the very name is equivalent to calling us humanmammal. And yet this nightmare fuel was an actual ideal proposed by a palaeontologist as somehow more exciting than the already-horrifying overbred zombie-chickens embraced by the poultry industry. Dinologue explains original impetus behind illustrating the abominations along with a gallery of the many, many variations on nightmare fuel. Is a chickensaurus pretty much this chicken with a fake tail? When asked about this feathering nightmare during a late night brainstorming session at Science Hack Day San Francisco, palaeontologist Trevor Valle declared that no matter how much he theoretically loves the concept of dinosaurs, he never, ever wants to see them in real life. His reasoning is entirely direct: Tyrannosaurus had a bite strength of in excess of ten thousand pounds per square inch, and "That's damn terrifying, and I never want to be near it." So, bringing T-rex into chickens is an inherently bad idea unless we're eager for free-range chickens to be fully capable of defending themselves from all threats. Neuroscientist Erik Peterson interjected with a disquieting question "Has anyone considered the concept of dinosaurs pecking?" That was distressing enough to send Valle lecturing onto a the ethical horror of Pleistocene Park: Why clone an animal that lived in an environment that no longer exists? In his opinion, that is anti-ethical: "Cloning one or two animals would lead to what? Letting them die and dissecting them?" He finds bioengineering lifeforms entirely unsuited to their environments (ancient equivalents of ecologically-inappropriate avocados or bringing back the wooly mammoth without the Mammoth Steppe they roamed in days of old) "flat-out rude to the animal. We're bringing back a single, solitary animal to live until it dies. It was naturally selected for extinction." Physicist Devon sent us on a new tangent by bringing up the social component of herd animals, asking "Is it still a mammoth if it has never been around another mammoth?" To this, Valle argued this was yet another reason to never clone the mammoth: as social aspects are essential to understanding the science of mammoths, we may as well stick with the modern analogue (elephants). Peterson disagreed as he finds even a single system fascinating, not as much for the actual process of bringing back a mammoth (or inventing a chickensaurus) for study but for the technological capacity the very question implies. Although he agrees it would be worth debating the ethics of whether or not we should be permitted to do it, he'd love it for us to be at the stage where that debate is motivated by real capacity, not theory. So, what do you think? 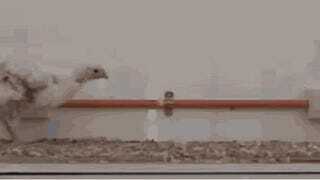 Would it be scientifically interesting to bring out the dinosaur in birds? Or would that be ethically abhorrent, and we should spend our energy looking at the animals that exist today. ...although I think we're probably all in favour of really tiny, cute, happy chickensaurus, unless it's like the ones illustrated at Dinologue.